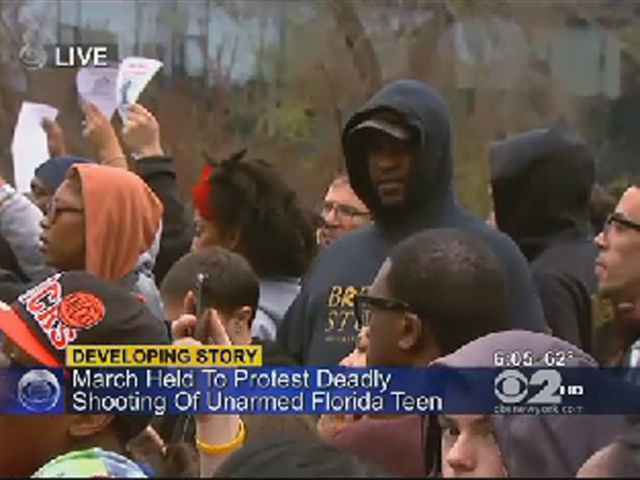 (CBS/AP) NEW YORK - A march took place Wednesday evening in Manhattan calling for justice in the case of Trayvon Martin. He was an unarmed black teenager who was shot to death by a neighborhood watch captain in Florida last month. In New York, Martin's parents told demonstrators chanting "we want arrests" that they will keep fighting to get justice for their son. "My son did not deserve to die," Tracy Martin, Trayvon Martin's father, said on Wednesday. He immediately thanked the hundreds of people who participated in a march in her son's memory. Martin, 17, a high school junior, was unarmed and wearing a hoodie when he was fatally shot. Wednesday's demonstration in Union Square was dubbed the "Million Hoodie March." Many participants wore hooded sweatshirts for the march, which was billed as a demonstration to put an end to racial profiling, CBS New York reports. Martin was killed Feb. 26 in Sanford, Florida. He was returning to a gated community in the city after buying candy at a convenience store when he was shot by neighborhood watch captain George Zimmerman, who has not been charged in the shooting. He has said the teen attacked him and he shot him in self-defense. The demonstrators greeted the teen's parents with "God bless you!" Sybrina Fulton, Trayvon Martin's mother, told the crowd: "My heart is in pain, but to see the support of all of you really makes a difference." "This is not a black and white thing - this is about a right or wrong thing," Fulton, said. Tracy Martin said he and his son's mother found out about the march after arriving in New York City, where they have done interviews about the case. They got in touch with the organizers to say they would attend and speak to the crowd. The timing of the teen's parents being in the city when the march was happening was "incredible," said one of the organizers, Daniel Maree, who heard about the case earlier this week. "I was outraged and wanted to do something about it," Maree said.